Are you ready to adopt a homeless cat or dog and give them a second chance? Are you ready to fall in love? Come to the ASPCA Mega Match-a-thon – a 24 hour, round-the-clock, adoption event! 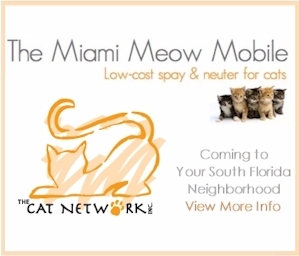 The Cat Network, Inc., Humane Society of Greater Miami and Miami-Dade Animal Services, along with many other local rescue groups, are joining forces to SAVE lives! Miami is one of the 55 communities nationwide selected to participate in the first event of this kind. Hundreds of deserving dogs, cats, puppies and kittens will be looking for forever homes. The event will start at midnight with a puppy and kittens marathon – you don’t want to miss it! – Adoption fees as low as $30 with tag. Our mission is to save more lives and we need your help. For more information call 305-749-1825.